There once was a man called Sage, who refused to work for minimum wage. But then, one day, he received, more pay, because he got a job performing on stage. Want to know more? 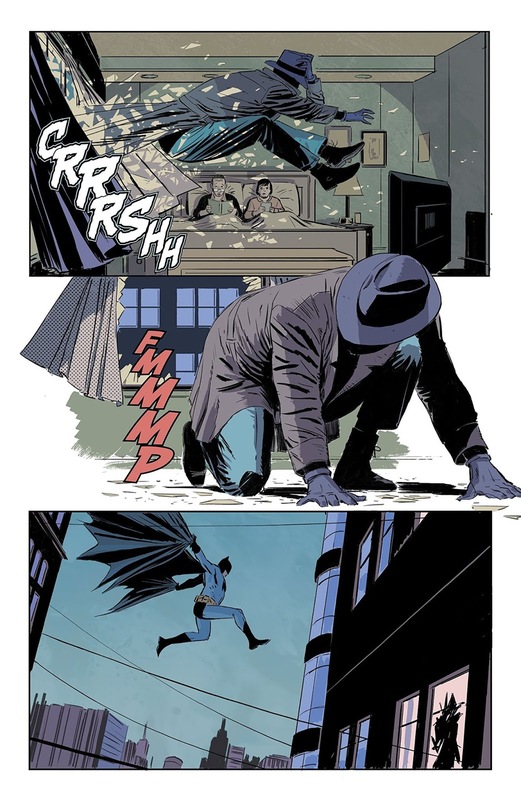 Then please ignore the following adventure created by Tom King, Jorge Fornes, Lee Weeks, and published by DC Comics in April, 2019. TO QUOTE Mary Astor: ‘Once you start asking questions, innocence is gone’. In order to help Batman escape from a series of nightmares, Vic Sage, otherwise known as The Question, attempts to ask Catwoman one very important, well, question: Why did she leave Batman standing at the altar, and does she think he’s able to cope with their sudden split? Part One) A QUESTION OF TASTE: Now I know this may seem like a rather strange thing to say, but in all seriousness, I have a sneaking suspicion that Tom King uses this series as some form of therapy. After all, most of his stories are based on two people talking to each other about their thoughts, their feelings, and their motivations for doing x instead of y. Case in point, in issue 66 of Batman, we are presented with a scenario where Selina Kyle has to talk about her relationship with the venerable Dark Knight. But, unlike the numerous times she's done this in the past, this time she’s talking to Vic Sage, a.k.a. 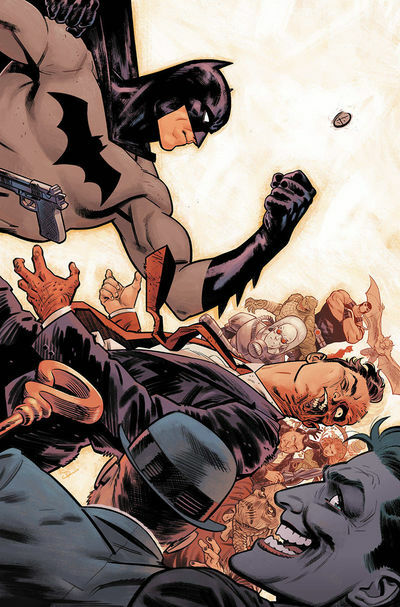 The Question, with the intent of saving Bruce from his current predicament. That being, the current Knightmares saga! Please note, though, that no explanation is given as to how this will save him -- on a practical level, at least -- or how Vic and Selina got involved with this event in the first place. What’s more, it's never fully explained how this particular chapter is connected to the other chapters, or even if these events take place in a sequential order. Which, in all honesty, kind of makes this storyline seem as vague and as irritating as a fart in a crowd! Come to think of it, I wasn’t that keen on some of the repetitive parts of this story either! I mean, with all due respect, how many times do we have to hear Selina or Bruce talking about how they first met, how they feel about each other, and all of that razzmatazz? Three times? Four times? Maybe more? Because by now, all of this is starting to become fairly formulaic by design, both in tone and structure, to the point of becoming very very monotonous. Besides, Batman has overcome far worse tragedies in the past, so I can’t see why he’s having a tough time with this one right now. Having said that, though, issue 66 did have a couple of redeeming features which I generally admired; like the artwork, for instance, the artwork provided by Jorge Fornes. Aesthetically, his smartly composed illustrations kind of reminded me of the work produced by two other Batman artists: David Mazzucchelli, who’s best known for drawing ‘Batman: Year One’, as well as Michael Lark, who’s best known for drawing ‘Gotham Central’, keeping in mind that Jorge’s style of art isn’t a direct copy, but rather, a homage of sorts to their illustrative brand. 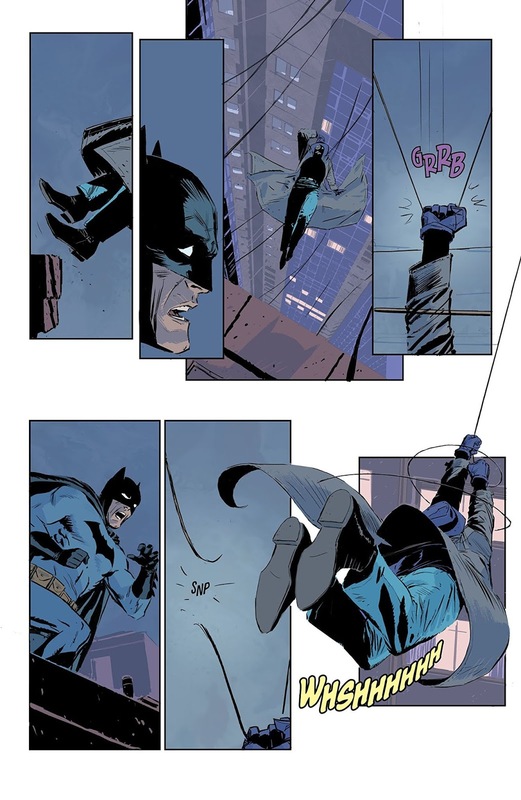 Now, this can be seen during those atmospheric flashback sequences between Bruce and Selina, or alternatively, during those very cartoonish dream-like sequences where Batman fought against The Joker, Mr. Freeze, The Riddler, or The Penguin. So, overall, I’d say that a great job was done in the art department right across the board. 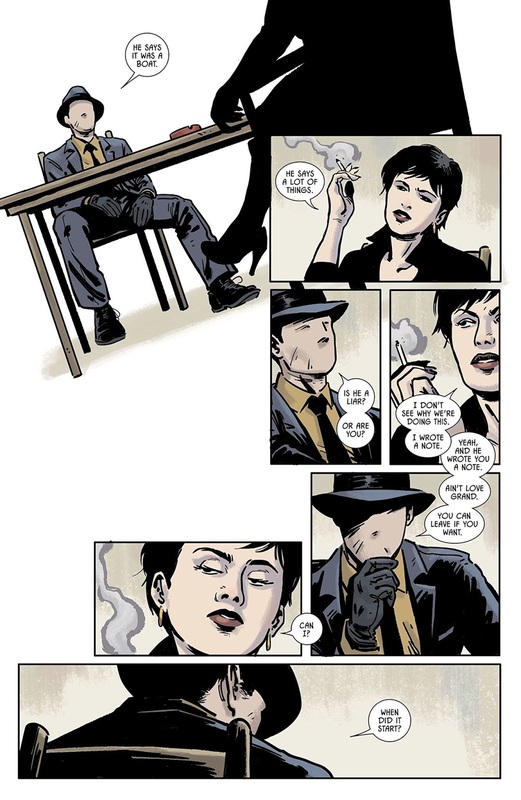 In addition to this, I also got a big kick out of seeing Selina smoking (as she seems the type), along with seeing Vic Sage’s version of The Question again. Well, with all due respect to Renée Montoya’s version, but I generally prefer the original incarnation created by Steve Ditko (who also co-created Spider-Man), largely due to him being more grounded, more down-to-earth, and more akin to his pulp / fringe roots. How about you, dear reader? Which version of The Question do you prefer? Vic or Renée? Or don’t you really care about this particular character? Either way, please feel free to leave your thoughts in the comment section below. Part Two) MEEP-MEEP: If you’re a fan of silent films, Tom and Jerry cartoons, or atmospheric adventures that go bump in the night, then I’m sure you will enjoy reading certain parts of issue 67. Although, on second thoughts, maybe the word ‘read’ isn’t exactly the correct word to use. But rather, look, gaze, or better yet, follow, simply because the entire issue is devoted to a long, wordless, and very exciting chase scene between Batman and an unknown perpetrator. 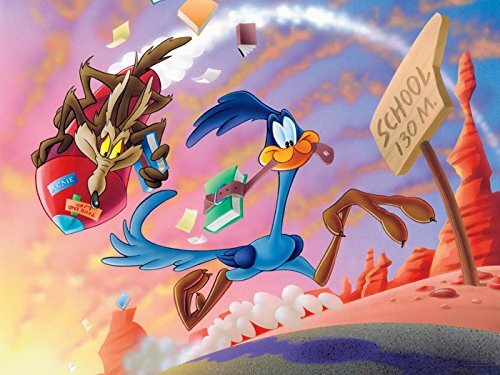 Similar, in fact, to one of those Looney Tunes animations featuring Wile E. Coyote and Road Runner, meep-meep, which was duly referenced at the end of the book. As a matter of fact, I thought this story was also somewhat similar to two other wordless comic books published in the mid to late eighties. One of them was published by DC, written by John Byrne, and drawn by Jim Aparo: Batman #433, a.k.a. 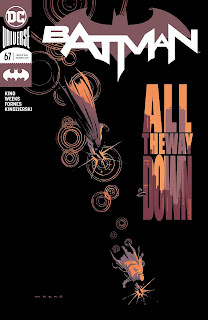 'The Many Deaths of the Batman' (Chapter One); whereas the other one was published by Marvel and written and illustrated by Larry Hama: G.I. Joe: A Real American Hero (Volume 1) #21, a.k.a. 'Silent Interlude'. Although, in this case, the entire story was basically a lengthy kinetic chase scene between two men, instead of a steady sequence of scenarios which eventually carved out a fairly cohesive narrative. Not that this is a bad thing, mind you. If anything, this book was a fairly pleasurable experience because it was atmospheric in places, dynamic in others, and overall it's fluid style flowed in a very lucid fashion. So much so, in fact, that I couldn’t always tell which pages were illustrated by Lee Weeks and which pages were illustrated by Jorge Fornes! Seriously, folks, these two artists are the best, and they both deserve a well-earned pat on the back, pat-pat-pat, for being consistent, highly creative, and very talented with their noir brand of storytelling. That said, however, I do have two slight gripes with this issue. Firstly, it was a very quick read which took me about two minutes to complete (if that). And secondly, just like the previous chapters in this current Knightmares storyline, I don’t have a clue as to how it’s connected to any of the other chapters. Apart from that though, yeah, I liked it, I liked it a lot, especially it’s ending, yet it would’ve been nice if the plot had a bit more substance and the overall arc had a bit more depth. So, what do you think, dear reader? Are you a fan of this type of all-silent issue? And if not, why not? After all, comic books are a visual medium, and as such, it’s a good idea that we all get reminded about what they are, rather than what they're not. Either way, you do what you have to do. Comment. Share. Etc. Do you know what I wanted to say to Catwoman when she kept on going on about her relationship with Batman? No! I didn't want to say that! You dirty-dirty sod. What I wanted to say instead, was, ‘What’s New Pussycat?’, which just so happens to be this month’s ironic musical match-up (as sung by Tom Jones)! Yes. That's correct. For fairly obvious reasons, I’m now going to compare issue 67 to the Road Runner series of cartoons.